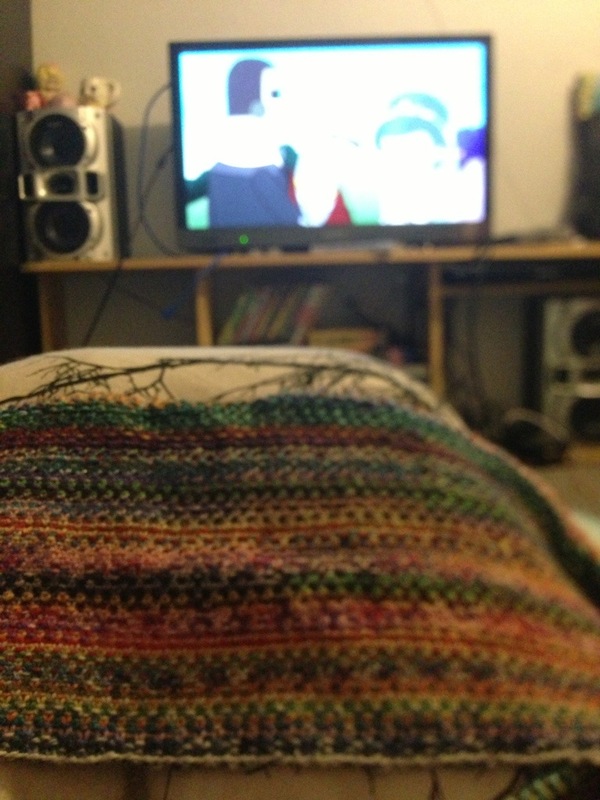 Apart from the blip that was embroidery, I’ve only knitted on the items which I disclosed last Tuesday. I had every intention of setting them up next to a ruler to show the progress and taking nice photos of them all. But we got home later than usual last night, and I found myself at 7:30 unable to keep my eyes open let alone deal with the terrible light in our apartment. I have found out that a cabled jumper is not the best thing to be knitting during a close game of football, but it was quite good to knit during Little Dorrit. My mum leant me the DVDs so long ago that when I returned them on Sunday she had forgotten she had given them to me. If you haven’t watched it I thoroughly recommend it. It’s a mini-series based on the Charles Dickens novel of the same name (which honestly I had never heard of before I watched it, now I’m reading it – its free on ibooks.) It has a huge cast and at one point I was playing a game of ‘ooh they’re from doctor who’, ‘she’s from hotel babylon’, or ‘he’s from vicar of dibley’. Parcel is now at the point where I need to figure out how many stitches I have. Because I didn’t follow the pattern (because I didn’t read the instructions properly) I now need to decrease sharply, or do some maths. I’ve turned the heel on my vanilla latte socks. 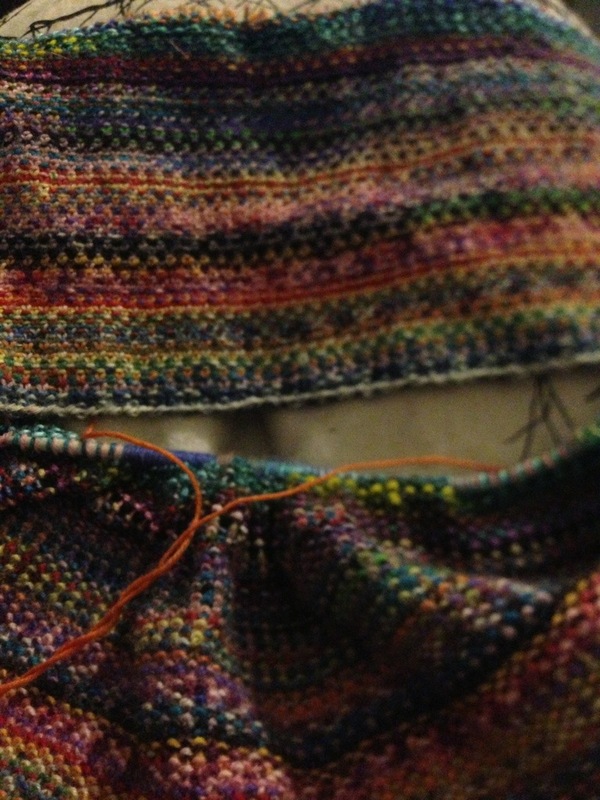 I have a few more rows of the pattern and then I’ll start the ribbing. I really hate the heel on them. I’ll chalk it up to experience and delete the sockcalc app from my ipad. I’ve been aiming for 2 – 3 rows on mini-mania every night and except for last night I achieved that. So here’s how long that looks now, using my hand as a guide. 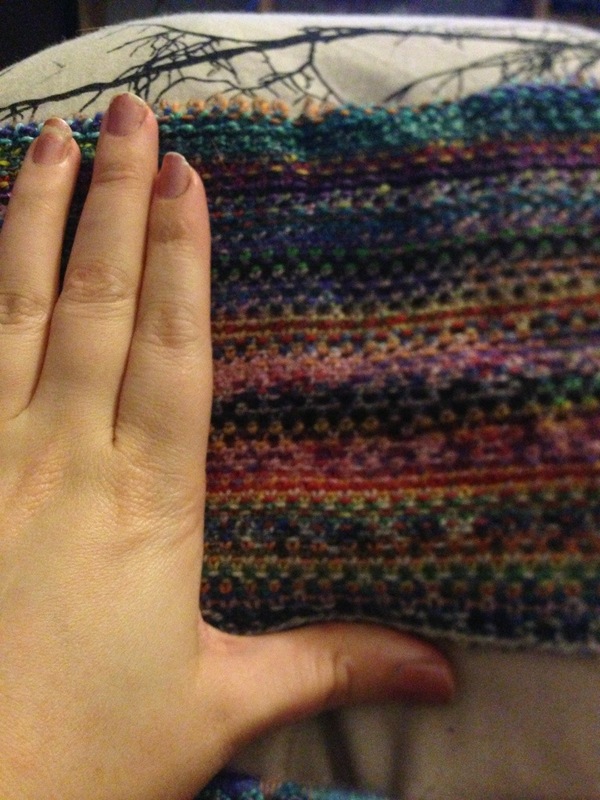 Pretty soon I will have to compare it to a few existing scarfs so I now exactly where I’m aiming for. Otherwise I will get impatient and cast off and then always regret it. Looks as if the scarf will be wide enough soon 🙂 I sympathise, long rows and linen stitch (I’m guessing) are not the best motivator, but it will look lovely when it’s finished!